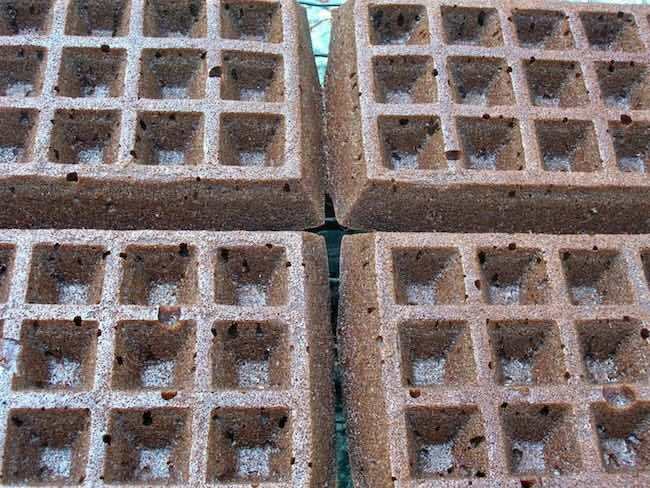 This recipe for chocolate cake waffles is a little unusual, but none the worse for that. The waffles are at their best served warm with lemon curd and strawberries. Whipped cream makes them even more delicious and decadent. Best eaten for a special occasion dessert. When I was browsing through Chocolat by Eric Lanlard in order to write the review I posted recently, I was caught by his recipe for chocolate waffles. I knew I would have to make them in the not too distant future. When I came back from a preserving course at River Cottage, laden with lemon curd (amongst other things), I knew the time had come. Chocolate waffles with a big dollop of lemon curd had my name written all over it. So, a couple of days ago, I searched out my silicone waffle moulds, got out my trusty bowl and wooden spoon and gaily set out to follow the recipe, deciding to reduce it by half. I hadn’t got very far when I realised something was seriously wrong. What was Eric thinking of? Indeed what were his editors thinking of? I’ve made several recipes from this book and they have all turned out well, so I was expecting plain sailing once again. It was the amount of sugar that first set the alarm bells ringing. 300g? Surely that couldn’t be right. If I’d read the recipe properly before I’d begun, I’d have realised this was a cake mixture not a pancake one; I’d have then made up my own waffle recipe instead. However I’d already melted the butter and mixed some of the other ingredients, so I carried on, severely reducing the amount of sugar and increasing the milk from one tbsp, yes that’s right only one, to twelve. I had a look online to see if anyone else had reported any issues with this recipe. I couldn’t find any, so maybe I’m the first person to make it??? Anyway, here is a link to the original ingredients so you can see for yourselves. These waffles may not have been the light crisp affair I had been imagining, but they were still seriously good. Even with the reduced amount of sugar and the extra milk, these were still very much cake rather than waffle. They were quite substantial affairs and one was more than enough, so the four cake waffles I made lasted us over two days. We ate two warm from the oven, but the other two were just as good cold. Strawberries are now in season so they had to be included. I managed to pick a few wild ones from the garden, which were totally scrumptious. If you can’t get wild strawberries, don’t fret, cultivated ones can be very nearly as good. On day two we went well over the top with cream and bought strawberries in addition to the lemon curd. Strawberries and lemon curd I have now discovered are a match made in heaven. CT was equally enamoured. In fact the whole combination was superb and I now know what cake I’m going to make for next week’s party. The chocolate waffles will have to wait for another day. Homemade lemon curd is the bees knees. It’s so much nicer than any commercial brand I’ve ever tried. For something a little different and if you’re in the middle of an apple glut, you could try making this apple lemon curd recipes instead. 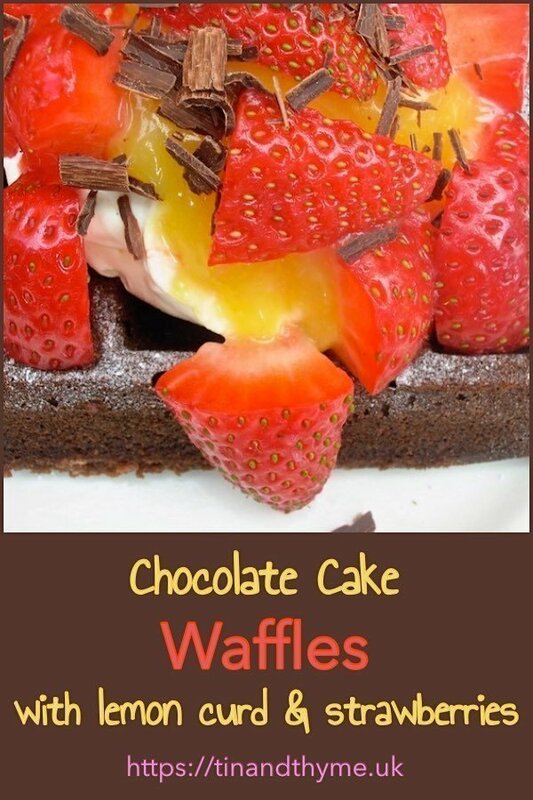 I’m sending these chocolate cake waffles off to Bookmarked Recipes with Jac of Tinned Tomatoes. They also go to Made with Love Mondays over at Javelin Warrior’s Cookin w/Luv. Likewise they go to Emily over at A Mummy Too for #recipeoftheweek. And as strawberries play an important part in the consumption of these cake waffles, I’m sending them off to Lets Cook with Strawberries over at Simply Food. Bake of the Week must not beforgotten either over at Caso Costello. Cook Blog Share over at Supergolden Bakes also gets one of these chocolate cake waffles – I’m beginning to think I didn’t make enough! Finally, one also goes to Tasty Tuesdays with Honest Mum. Thanks for visiting Tin and Thyme. If you make these chocolate cake waffles, I’d love to hear about it in the comments below or via social media. Do share photos on your preferred social media site and use the hashtag #tinandthyme, so I can spot them. For more delicious and nutritious recipes, follow me on Twitter, Facebook, Instagram or Pinterest. Chocolate Cake Waffles. PIN IT. A decadent dessert when served warm with lemon curd, strawberries and maybe cream as well. Melt butter in a pan over low heat, then leave to cool a little. Pour in the butter and vanilla extract. Start mixing into the flour from the inside out, adding the milk as you go along. Spoon into four silicone waffle moulds and bake in the oven at 180℃ for 17 minutes. Alternatively use a waffle iron. Leave to cool a little then turn out onto a wire rack. Dust with icing sugar, then pile on lemon curd, strawberries, chocolate shavings and cream if you're feeling really decadent. The lemon gives that bit of zing that strawberries don’t have and somehow brings outt the flavour more. OMG!!! that looks amazing!!! i’m on a diet, I really should not have looked at this!! This sounds drool worthy, lemon curd, chocolate and strawberries what an amazing combo.Thank You for sending it to Lets cook with strawberries event at simplyfood. Thanks Nayna, it was indeed an amazing combination. Thanks Karen, lemon curd is rather wonderful. They look great, your lemon curd looks like it has a perfect consistency and I can imagine it would be a good contrast to the chocolate waffle. I’ve never made waffles, as I don’t have a waffle iron! Thanks Janice. I don’t have a waffle iron either, but I do have silicone moulds that work wonderfully well. Yum! A chocolate waffle would be most welcome right now! 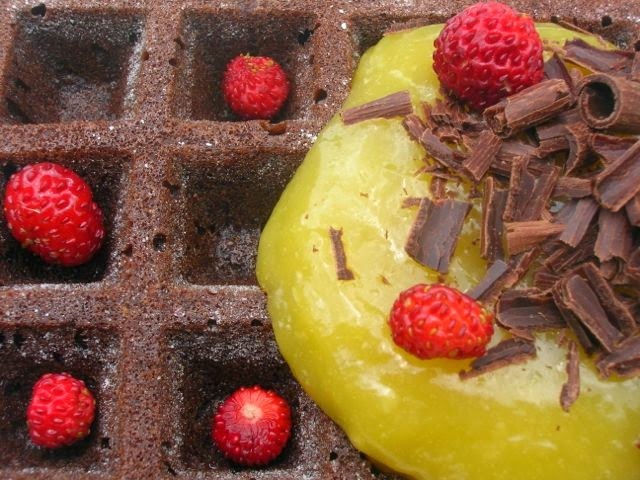 Hmm, chocolate waffles with lemon curd sounds amazing. Chocolate, strawberries and lemon curd? What a scrummy combo! It’s a fab combo Emma – just writing up my next post where I’ve used it again. Thanks Jac – I used the same combo for my birthday cake and it seems like everyone else thought it was a winner too.